Mardi Gras is around the corner and as a Catholic, that means Lent is on its way as well. While I have never been to New Orleans I sure love to celebrate Louisiana Style Cuisine once in a while. 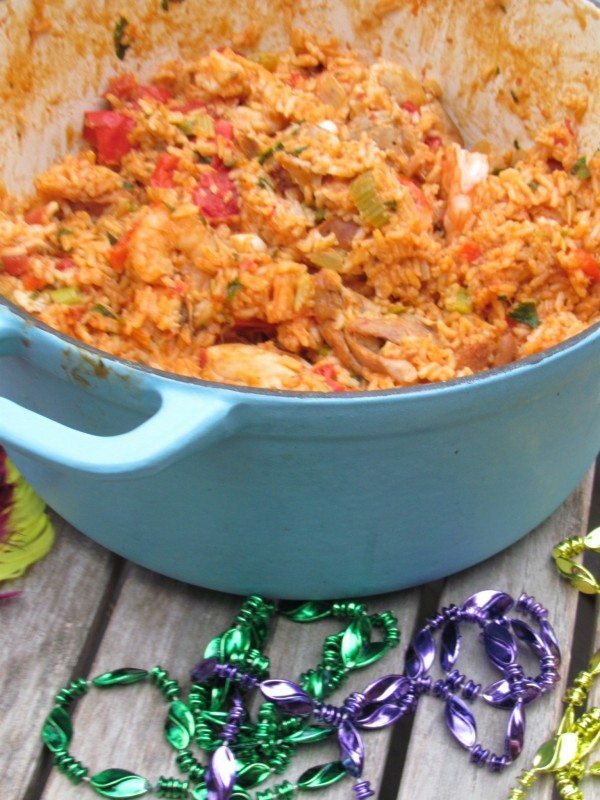 What I love about this Mardi Gras Food recipe, while there are many ingredients, it really can be a weeknight dinner. It is all cooked in one big dutch oven , a kitchen must have I discovered only in the last couple of years and love it. Outside of chopping the veggies you really don’t have that much involvement as the rice just cooked inside the untouched pot! I would definitely use spicy andouille sausage and use more of the spices suggested. 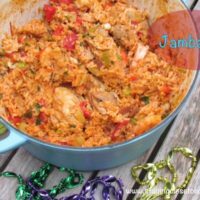 I prepared this jambalaya recipe on the mild side which is safe but you can always add tabasco, you can not take spiciness away. Saute all the yumminess and the foodies in your home will start coming out of the wood work. I misread the directions and added the entire can of tomatoes without draining them, it still came out fine. I just reduced the broth by one cup. It may be more red than a traditional jambalaya but we did not mind. 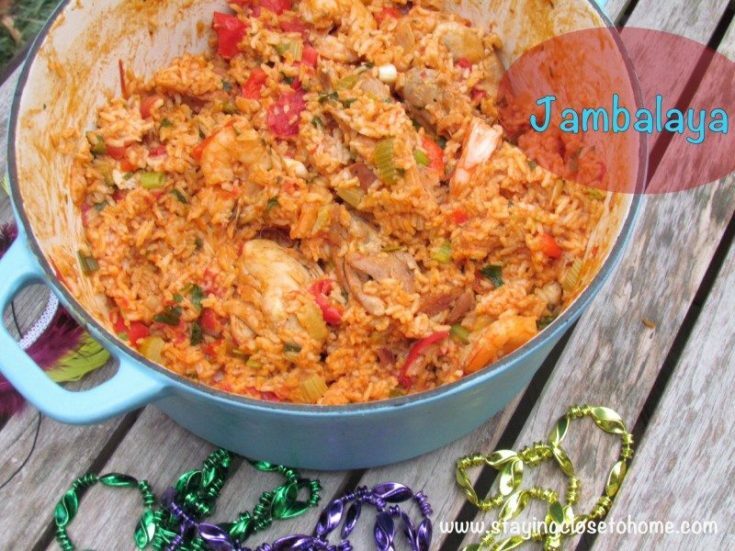 This Jambalaya recipe makes a large pot and the suggested serving size is 8. I definitely agree with that. Our family of 5 will have this for another dinner this week. Just don’t microwave the shrimp they will get all rubbery!! This one pot meal that is nice enough for dinner guests but easy enough for a family dinner is just what the chef ordered up. While we did not have homemade King Cake I will post about the amazing chocolate cake he chose in the next couple of days. Hopefully with the start of Mardi Gras will be the start of Spring too. Now what to give up for lent?? Be sure to serve our Homemade King Cake for dessert. What is your favorite Low Country or Mardi Gras Food Recipe? Heat the oil in a large Dutch oven or black iron pot over medium heat, add the kielbasa and sauté for 8 to 10 minutes, until browned. 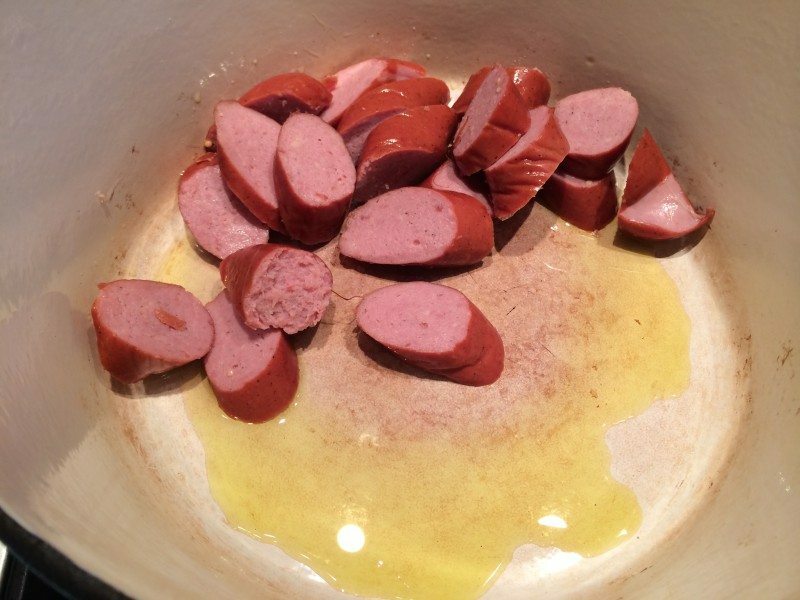 Remove the kielbasa to a bowl, and set aside. Add the chicken thighs to the same pot and cook 5 minutes per side, until lightly browned. Remove to the bowl with the kielbasa, and set aside. Add the butter, onion, celery and peppers to the same pot and sauté for 8 to 10 minutes, until the onion is translucent. Add the tomato, garlic, jalapeno or cayenne, oregano, thyme, 1 1/2 tsp of salt and tomato paste and cook another 2 minutes. Add the white wine and scrape off the brown bits at bottom of pan. ( you can stop here and continue 40 minutes b/f serving. Add the stock and bring to a rolling boil. Stir in the rice, and add the sausage, chicken, bay leaves. Return to a boil, reduce the heat to low and simmer, covered, for 20 minutes. Add the shrimp and cover for another 5 minutes. Add ¼ cup of the scallions, ¼ cup of the parsley, the lemon juice and the shrimp, and stir well. 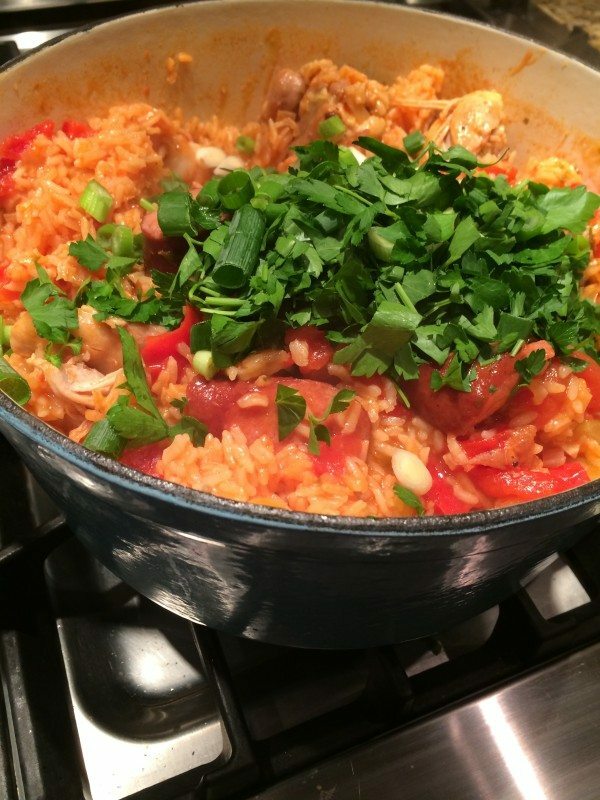 Cover the pot, remove it from the heat and allow the jambalaya steam, for 10- 15 minutes, before serving.Garnish with the remaining ¼ cup scallions and ½ cup parsley, and a dash of Tabasco, if desired. « Kids and Technology What is it really teaching them? 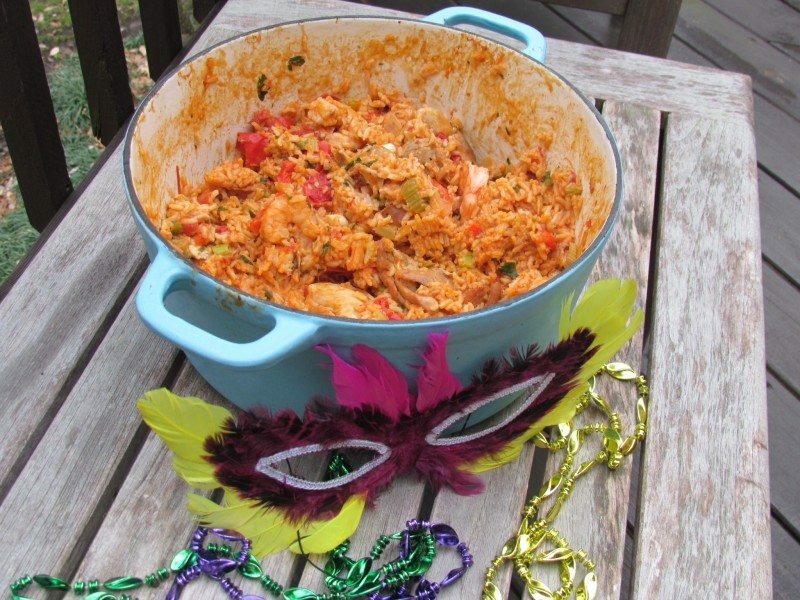 What a great pot of Jambalaya to celebrate Madri Gras, it looks fantastic! Thank you so much for sharing with Full Plate Thursday and have a great weekend. Ok, this looks way to good. I’ve have got to try your recipe. I have started loving spicy foods the last couple of years and this sounds delicious.